This is a special WSC bonus podcast targeted specifically for today because it contains information regarding the United Hollywood’s Pencils2MediaMoguls campaign. 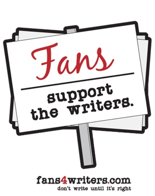 The idea is that since the start of the strike fans were asked to buy pencils to send to the six media moguls who run the six corporate conglomerates to demonstrate their support for the writers of their favorite TV series. In this episode, I speak to Jeff Berman with United Hollywood. At the time of this recording, he was reluctant to give the details about where over 500,000 pencils were going to be delivered. So, I waited to release this episode until the information became available on-line. Today at 11:30 a.m. the pencils will start being delivered. The staging ground for this event will be Johnny Carson Park, located at 400 Bob Hope Drive in Burbank, just across the street from NBC. Writers slated to appear include: Ronald D. Moore (Battlestar Galactica), Joss Whedon (Buffy, the Vampire Slayer, Angel, Firefly), Alfred Gough (Smallville), Miles Millar (Smallville), and others to be announced. Read Time Magazine's Person of the Year for 2006.